Two polls in the past 24 hours: Angus Reid and EKOS. The big news: the Conservatives have built up a lead in Ontario, even while struggling in Atlantic Canada, Québec and BC. The Liberals only get good news in Atlantic Canada though - obviously Ontario is not going well for them, but the same also goes for BC, where the NDP is running strong at the expense of both the Tories and the Grits. The average Tory national lead is slightly up, to 5.4%. 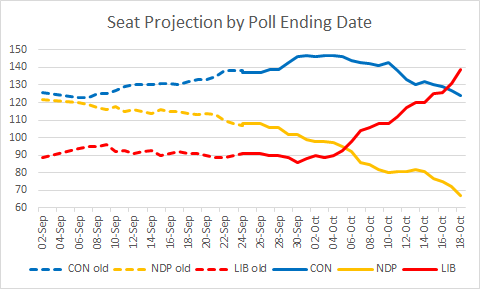 Ignatieff has now lost almost all of the ground he had gained in the summer, and we are almost back to the situation in April/early May, when the seat numbers were flat for all parties for weeks. Are these numbers now the default? Not much time today, but here's Harris-Decima latest national poll, and Léger Marketing's latest Québec poll. The most interesting development is that both have the Conservatives dropping back to the mid-teens in Québec. Their stay in the low-20s was probably a very temporary bump from the Quebec City arena story. In Harris-Decima's poll, Ontario remains a dead heat between the two main parties, and the NDP scored a paltry 12%, which casts doubt on the NDP bump shown by the recent Nanos and Angus Reid polls. The Tory average national lead drops back to 5.0%. After two weeks of poll drought, two polls are out today! 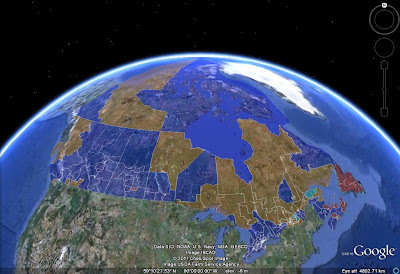 First, the Nanos poll, while showing unsurprising national numbers (except maybe the low 4.9% for the Greens), has interesting regional figures: a dead heat in Atlantic Canada (good for Tories), a strong 27.7% for the Liberals in Québec, a 6-point Tory lead and an NDP rebound in Ontario (very bad for Grits), and a Liberal/Conservative dead heat in BC, with the NDP close behind. Generally speaking, this is a bad poll for the Liberals, as the silver linings in Québec and BC are not significant enough to compensate for the bad news in Ontario. The EKOS poll, as usual, covers two weeks. 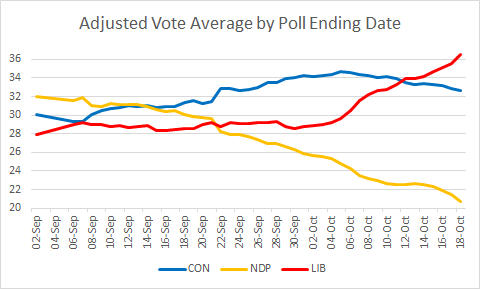 The first week mostly overlaps with the Nanos polling period, and the Conservative-Liberal national gap is identical to the one shown by Nanos; EKOS shows a bigger Tory lead in the most recent week. Regional figures in Ontario and BC are very different from Nanos' numbers, however: EKOS still shows a dead heat in Ontario, while it has the Liberals third in both weeks in BC. EKOS also has much lower figures in Québec for both the Grits and the Tories (to the benefit of the Greens) than Nanos does. This is the sixth projection in a row showing a seat gain for the Conservatives. The Tory average national lead jumps to 5.8%.